It’s the season of mangoes and everyone around me (including me!) is going gaga over this magical fruit. But I have a confession to make. Mangoes can be boring (there, I said it!). But hear me out. Mangoes are juicy and fleshy but it offers only a one dimensional flavor. It’s a safe and predictable flavor but then, we all know how mangoes taste, right? Mango as a fruit is great, yes. But mango with an edge is simply amazing. That’s why when HyperCITY asked me to create a unique recipe with mangoes; I was thrilled because finally I had the opportunity to create something interesting and fun. And since the Indian summer is ensuring that we are losing our bodyweight by sweating, the best idea is to create a cool and refreshing salad. But not just any salad my friend, but one with a cool twist and I am pretty sure you will love it. Clean the rocket leaves and iceberg lettuce thoroughly and keep it in a salad bowl. Blanch and peel the tomato and cut into thin slices. Keep this in the salad bowl and mix well. Add the apple cider vinegar, salt and pepper and toss well. Set aside. Chop the mango flesh into small pieces and plate it. 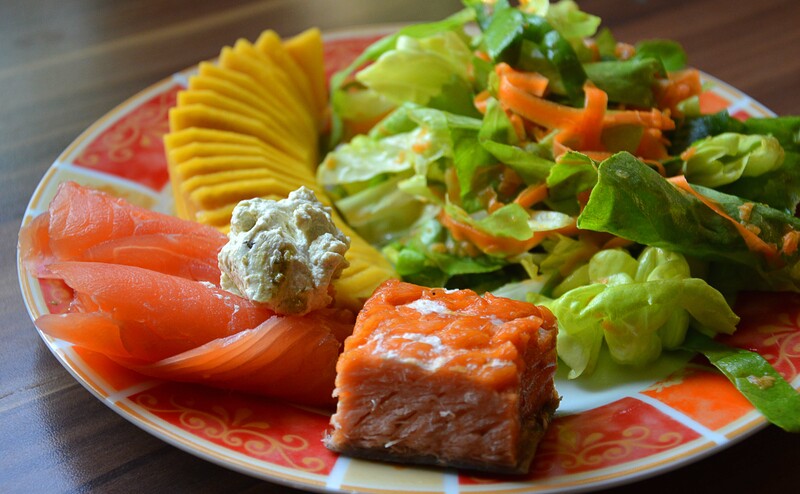 Chop the salmon into thin slices and place it next to the mango pieces. Take the salad leaves and place in on the plate. How simple was that, right? Let me know if you enjoyed the recipe. You are absolutely right—this is a great, fresh twist of a mango dish! Neha, Do you have a coleslaw recipe you recommend? I prefer using my own ingredients for the dishes, but I have followed so many different coleslaw recipes, I was curious which you found suits the mango and salmon best. I’ve never tried coleslaw on a salad like this, so I can’t wait to serve this dish! I am glad you liked the recipe Seema 🙂 I use a very simple coleslaw recipe with the regular ingredients. It goes really well withe dish.